Free Russian radical Ildar Dadin! Chicago—Opponents of Russian President Vladimir Putin’s reign of terror gathered in Chicago’s Millennium Park on Nov. 6 to stand vigil against the torture of Ildar Dadin and other political prisoners in Russia. Dadin was sentenced in December 2015 to three years in prison for violating Russia’s revised, more repressive law on public assembly by two acts of solitary protests in Moscow. As if three years imprisonment for one-man pickets defending political prisoners and opposing Putin were not draconian enough, Dadin has been subjected to repeated acts of torture. He was able to smuggle a letter out that accused the prison administration of sending gangs of ten or more to beat him daily. Other times he has been suspended from the ceiling by his wrists. 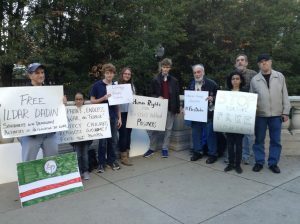 Ironically, Chicago Park Security asserted that there was no right to public assembly in Millennium Park, so they evicted all of us in solidarity with Dadin from three different locations. However, nobody was arrested—the ascension of Putin lackey Donald Trump is still weeks away. This entry was posted in Articles and tagged Bob McGuire, Chicago, Chicago Park Security, Chicago's Millenium Park, Ildar Dadin, political prisoners, torture, vigil, Vladimir Putin. Bookmark the permalink.